Today is the anniversary of 9/11 as many of you already know, and I felt that it was important that I cover the side of the story which means the most to me: The loss of life caused by both sides of the conflict. My first gut idea was to do an exposé on the all the freedoms which were lost as a result of 9/11, and show that by giving up all those freedoms the United States and other “Western” countries all gave into the demands of the “terrorists”. Perhaps I will cover it another day, today I only want to discuss all the lives that were lost. I have been told that I show a lack of empathy because I don’t mourn the deaths of 9/11 properly. The fact is that I mourn every death, and while the nearly 3,000 people who died on 9/11 makes me sad, I am down right angry that a government allowed itself to be overcome by emotions that it felt justified taking the lives of over 66,000 civilians in another country. I created a chart which takes the total number of deaths reported by wikileaks (which is a few years OLD), and compared them to the total number of deaths and injuries in 9/11. I felt I had to compare the injuries of 9/11 because it was the only thing that came close to the destruction caused by the US military. 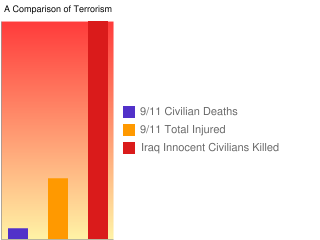 As you can see death for death, it would actually take over 22 terrorist attacks at the magnitude of 9/11 to equal the total number of deaths caused by the US invasion in Iraq. The people listed above are not soldiers, they are not “terrorists”, these are just the number of people who live normal lives and have normal families who will miss them every day. The people who are listed don’t like terrorism, and just because they are Islamic does not mean that they support the actions of their extremist counter-parts. 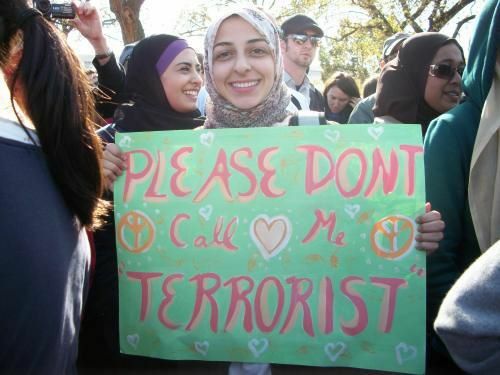 They are no more “terrorists” than mainstream Christians. 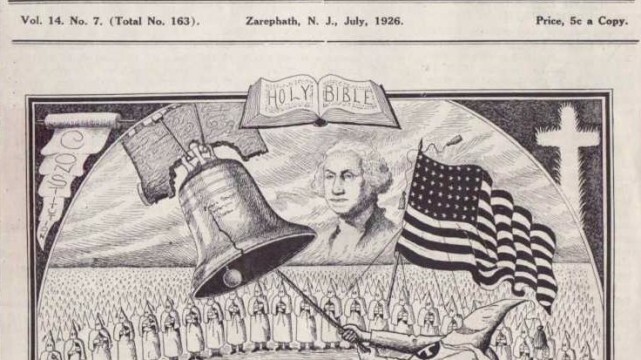 Let’s not forget that the KKK was created in the United States and is a Christian movement. It is hard to distinguish what is right and what is wrong when you have been so emotionally impacted. However, that’s exactly why there is Star Fleet regulation 619: The commanding officer must relieve themselves of command if their current mission leaves them emotionally compromised and unable to make rational decisions. The victims should never be the one left to create the punishment. Most legal systems in the world recognize this. Why is it that when it comes to war, this whole system of justice goes away? So yes, today I will mourn the death of those on 9/11 that were caused by the “Middle-Eastern Terrorists” and hold my head in shame for the horrible crimes committed by a government I hold citizenship to, and all the other “Western Powers” who have either helped or stood by and watched this all unfold. They had Facebook accounts, they used instant messengers, had family dinner with each other and did everything we do. The colour of their skin is different in most cases… however, I thought we were moving past race issues. The people who died (each and every one of the people in the chart above) all had people who they loved and people who loved them who will never see them again. We should be ashamed of ourselves for having such lack of regard for human life. Even if they are not within our invisible lines in the ground people are people…. Hur är kriget i iraq kopplat till 9/11? I övrigt håller jag med dig! The Iraq war was carried out nearly immediately after the Afghanistan war (which ALSO had high civilian casualties)… and I don’t think it would have happened (or at least got the support it did) without the events of 9/11 making Americans a bunch of warmongers. Furthermore, it doesn’t have to be directly tied to each other, it’s just showing that the United States talks about how much terrorism has hurt, when they are being terrorists themselves in other countries. For people who are well informed about these conflicts it is sometimes hard to remember the misinformation that many people still believe. Embarrassing though it is, we have to remember that many Americans still believe–shockingly–that Iraq was behind 9/11. Just a few months ago some of my students in China asked me and some other American teachers about whether we supported the war in Iraq. The other teachers said, “Yes, well, because of 9/11…” I was shocked that they still held this belief (and still have no idea where they got that, because the government didn’t even claim this–they had to push the whole thing about WMDs to legitimize the war.) But since then I’ve found that many other have the same misinformation. So no, Iraq had nothing to do with 9/11, but 9/11 did (unjustifiably) have a lot to do with the support for the Iraq war. Ok, I get your point and accept it. But it still seams strange to compare with the Iraq war. There is a war going on in Afganistan that would be more correct to compare with. I don’t know the numbers, but I think more people there has died as well. Well, to be correct, only roughly 500 of the roughly 3000 are actually confirmed deaths. The rest are just missing. Your blog is informative! Thank you!